A nice hand tufted light fill toddler wool comforter perfect for all seasons! Wool is one of the most optimal fill options for comforters due to its natural temperature regulating properties and bacterial resistance. 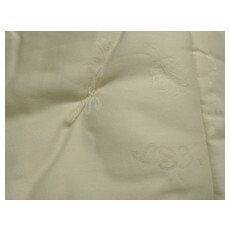 This comforter features an organic cotton sateen outer and organically processed ecowool for the inner. The sateen outer is smooth and simple, ideal in combo with a duvet cover to protect it. Our organically processed Ecowool, although not certified organic, we have found to be of equivalent purity to certified organic wool. In addition, Ecowool is from USA sheep, making it a great way to support our local economy! The comforter is hand tufted to prevent shifting. The light fill is recommended for most locations as a year round comforter. All of our wool comforters are spot clean only. A duvet cover is recommended if such is of a concern. Spot clean using 1 part natural cleaner or vinegar to 2 parts water. Being hand tufted and also made to order, it can take one to two weeks for this item to be made and ready to ship out. Made here at our San Diego, CA Facility.